As the leader in navigation and purpose-built hardware, Garmin has the necessary experience and tools required to assist your business needs. Our products are designed to help drivers and dispatchers improve customer response and optimize fleet resources with the goal of achieving lower costs and higher profits. Whether for localized delivery, less than truckload or long-haul trucking, we can provide your business with the tools you need to keep your mobile assets heading in the right direction. Watch the video to see our latest hardware platform in action. Our advanced fleet trucking solution combines the purpose-driven navigation experience of our top-selling premium trucking and automotive devices with the flexibility of an open and scalable hardware platform. Our fleet-ready portable navigators are interactive navigation and messaging terminals that provide a fleet management interface (FMI). They serve as mobile data terminals and much more in many of the world's leading fleet management solutions. 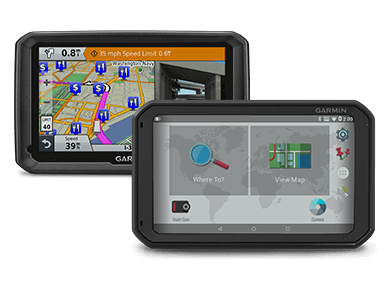 Garmin provides the standard for integrated navigation and mobile data terminal functionality in the fleet management industry. While we do not provide the end solution to customers, we do work through a large contingent of Fleet Management Partners who provide a wide range of unique customer solutions dependent upon specific verticals, markets, and business needs. Need help finding the right partner or interested in learning more about our products? Fill out this short form to be contacted by a Garmin representative or to receive more information. Garmin attracts a wide range of business fleets looking for integrated navigation and mobile data terminal services. If you would like to become one of our Fleet Management Partners who deliver unique solutions to businesses, click the link below. Our Garmin fleet™ and dēzl™ units are preloaded with detailed maps of the U.S. and Canada that also include truck-related restrictions, such as bridge heights, and related information for most major roads and highways. Just enter the vehicle profile information (customizable by height, weight, length, width and hazardous materials), and find truck-preferred routes suitable for that rig and load1. 1Not available in all areas. Entering your truck's profile characteristics does not guarantee your truck's characteristics will be accounted for in all route suggestions. Always defer to all posted road signs and road conditions. Our Garmin Fleet Updater service helps you update your fleet's software and maps quickly and easily. That way, your vehicle is back in service with the least amount of delay.